Pretty much the greatest app page ever by someone who works out of a basement. His own basement. Not his mom's. I just got the e-mail from Microsoft that version 2.0 of Lync News has been approved. It should show up sometime in the next 24 hours as an update in the Marketplace. This version is (more or less) a custom coded version. I am no longer using AppMakr.com to create this app but good ol’ Visual Studio. 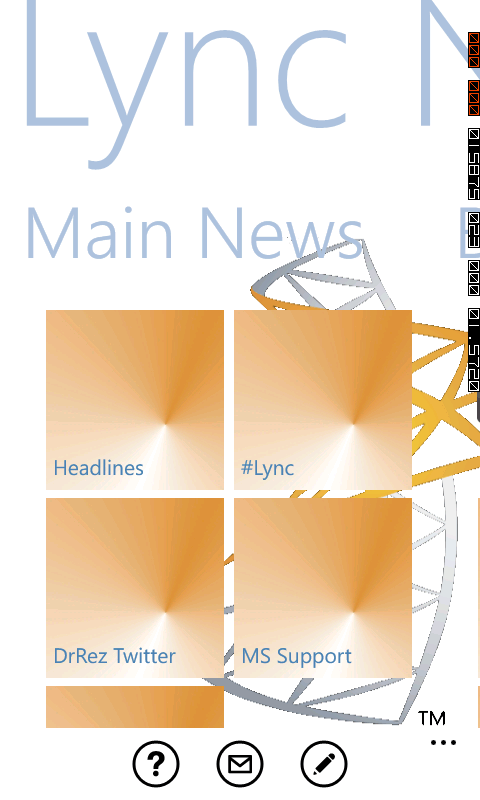 As such Lync News 2.0 now has a full Metro UI and requires Windows Phone 7.1 (i.e. Mango). There will be no version 2 for Android so if you are an Android reader you can quit reading here (or run out and buy a Windows Phone!). Beyond just changing the GUI, I’ve added a bunch of new feeds. Most of the same feeds as on the 1.X client are present. However, I have now added the ability to directly read pretty much every blog which is aggregated in the “Headlines” section. So if you want to drill down into a specific blog to read some historical posts you can do that. All posts are shown using the full IE browser. This will let you do things like read articles in panorama mode, save an article to the phones favorites, or share it with someone else via your defined social/e-mail accounts on your phone. There is also a new section entitled “Miscellanea” which includes some links to resources that aren’t necessarily Lync specific but I think could be of value to a Windows Phone owner. 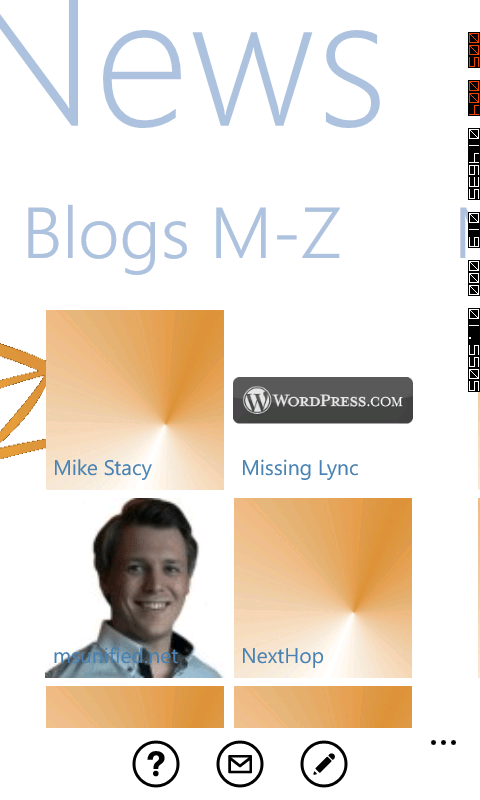 Lync News 2.0: Now with picture's of people. Just like Myspace and Friendster! And, I think most importantly, the icon has changed! The new icon now changes colors to match the theme you’ve selected on your phone. So for that reason alone this version is vastly improved over the 1.X AppMakr versions. I have plans to add additional features over time. Some of the features I simply cannot do because the Windows Phone API doesn’t support t them (e.g. no NSLookup equivalent). But if you have any recommendations for future additions, please leave a comment below or e-mail me at flinchbot@gmail.com. There are some optimizations and features that I have left out of this version just to get it out. I am about to start a new job and who knows how much time I will have to continue the development. So I thought it best to present it as-is. Please keep the following in mind: I am not a software developer. I am a Lync guy. So if some things seem odd or if the app crashes more than it should, I can only say I did the best that I know how to do. Quick stat: the version 1.X app was downloaded 4,274 times.